I absolutely adore rhubarb. It looks like celery except that it comes in an array of colors from red tinged green, to pinkish, to deep red (which still has a greenish center). 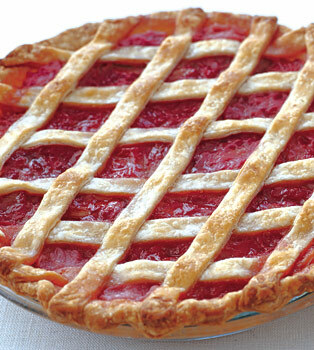 Vivid red stalks of rhubarb will give the pie a gorgeous rosy color. Also note that the lattice is created to allow a good amount of the filling to shine through. Rhubarb is very very tart and must be cooked and must be sweetened – but with just the right amount of sugar to allow it to remain sweet/tart (just like a good lemon dessert). Make this in the spring when the rhubarb is fresh. Blend flour, sugar, and salt in processor 5 seconds. Add butter. Using on/off turns, blend until coarse meal forms. Add 6 tablespoons ice water. Using on/off turns, blend until moist clumps form, adding more ice water by 1/2 tablespoonfuls if dough is dry. Gather dough into ball. Divide into 2 pieces, 1 slightly larger than the other. Flatten into disks. Wrap and chill at least 1 hour and up to 1 day. Combine rhubarb, 2/3 cup sugar, orange juice, orange peel, and cardamom in large deep skillet. Toss over medium-high heat until liquid starts to bubble. Reduce heat to medium. Cover and simmer until rhubarb is almost tender, stirring very gently occasionally to keep rhubarb intact, about 8 minutes. Using slotted spoon, transfer rhubarb to colander set over bowl to catch syrup. Drain well. Add syrup from bowl to skillet. Boil until juices in skillet are thick and reduced to 2/3 cup, adding any additional drained syrup from bowl, about 7 minutes. Mix in preserves. Cool mixture in skillet 15 minutes. Very gently fold in rhubarb (do not overmix or rhubarb will fall apart). Position rack in middle of oven. Preheat oven to 375°F. Roll out larger dough disk on lightly floured surface to 12-inch round. Transfer to 9-inch glass pie plate. Roll out smaller dough disk to 11-inch round; cut into 1/2-inch-wide strips. Spoon filling into pie dish. Arrange 6 dough strips atop filling, spacing evenly apart. Arrange 5 dough strips atop filling in opposite direction, forming lattice. Seal strip ends to crust edge. Stir cream and 2 teaspoons sugar in small bowl to blend. Brush over lattice, but not crust edge. Place pie on baking sheet pan to catch juices (you can line the pan with foil for easy clean-up). Bake pie until filling bubbles and crust is golden, covering edge with foil if browning too quickly, about 55 minutes. Cool pie completely. Cut into wedges; serve with vanilla ice cream, if you like.